Description: This print is from the first of three illustrated volumes combining kyoka poetry and scenes from nature that Utamaro produced in the period from 1788 to 1790. Insects are the theme of the first book, sea-shells are featured in the second, and bird life in the third. These books are exceedingly rare, and of course a small and delicate book is a difficult thing to exhibit properly, so some of his finest work thus remains hidden from view and unknown to the general public. 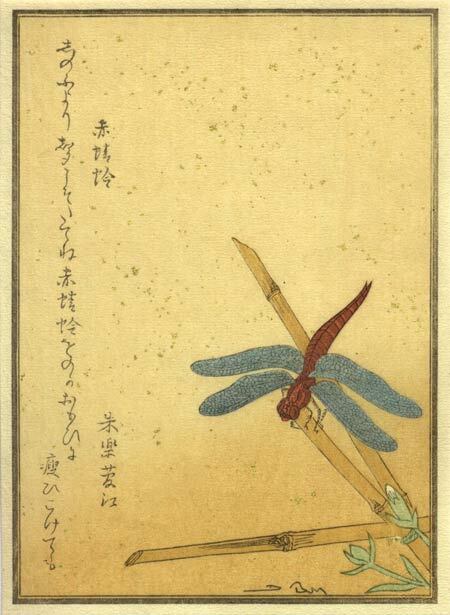 Each insect in the original book is paired with a poem, and the one on this print is by Akera Kanko, a poet with a strong connection with Utamaro; his poems are also included in the two other nature books. Entitled 'Red Dragonfly' (Aka Tombo) it is a love poem that seems to be drawing a comparison between the 'lovesick' writer, who, like the dragonfly without a voice, is unable to express his love. The original purchasers of the books in this series back in the mid-Edo era were of course connoisseurs of such poetry, and would see the words and images as being of equal importance. For us though, living in a different culture, one in which most of the subtle nuances and references in the poetry have faded away with the passing of time, the poem becomes simply a visual object, part of the overall image itself.